The Apollo 8000 series gravity gun is designed for the demanding automotive finisher. The 8000 lays down primer and under-sealers perfectly. Expertly engineered for the automotive market to give the best performance for a reasonable price. 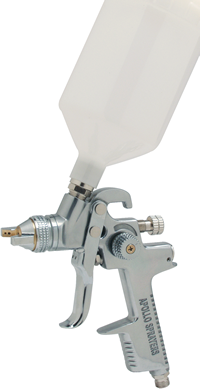 The Apollo 8000 compressed air HVLP gravity cup gun has a polished aluminum spray head and handle, 1.5mm nozzle and needle installed, and comes supplied with a 20fl. oz (600cc) gravity cup, sample bottle of genuine Apollo Spray Gun Lube and a wrench (spanner). Tip/Needle and air cap sets: 8000 –1.5mm (installed), and 1.8mm.